The first summit finish of the 2015 Giro d’Italia, the road up Monte Gomito to Abetone is something to look forward to but also a worry. It’s harder than the profile suggests and coming at the end of Stage 5 it could reveal who will win the race outright. Fanciful? Not really, it’s happened before. But enough fretting about the future, it’s been a classic climb and the launchpad for Fausto Coppi’s first Giro win. But most of time the Passo dell’Abetone is a regular destination for thousands of cyclists in central Italy keen to test their form on a long climb. From La Lima the SS12 heads north to Abetone. 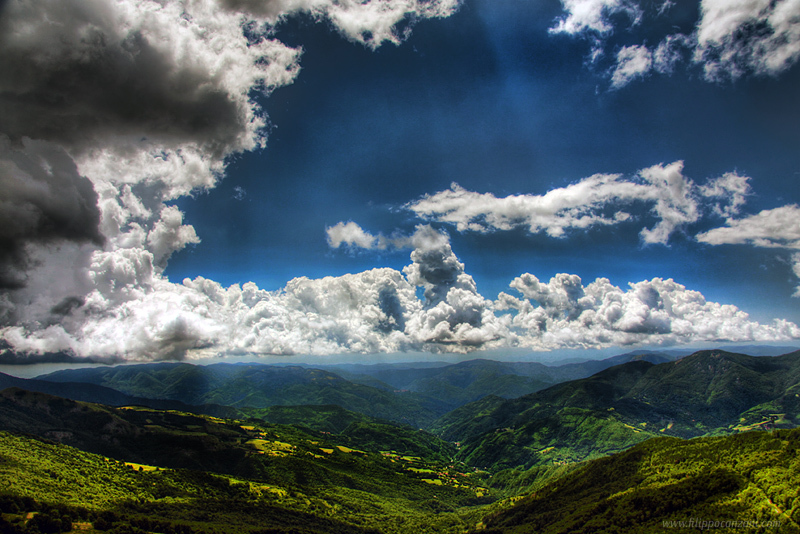 It is 17km and averages 5.4%, climbing to 1388m above sea level. 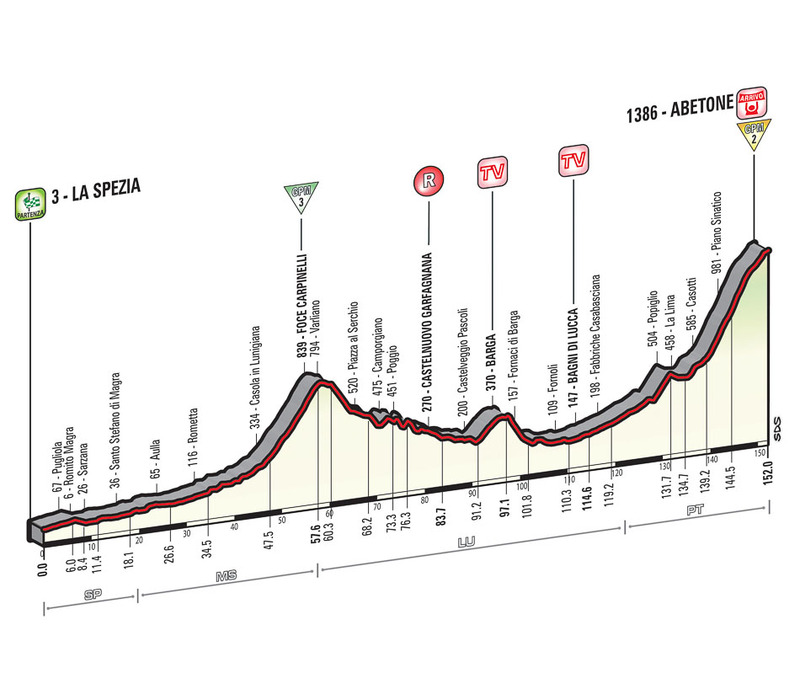 The Giro profile above says 1386m but presumably they finish just before the top. The Feel: the wide road is easy to find, there are not many choices in the narrow valley, plus it’s well-signed posted. You immediately sense it’s a major road given the signs to Modena, a large city far away. Factories making cardboard line the road, once they were mills powered by the Lima river, now by electricity and the Lima river seems all the better for it with clear water. It’s a gentle climb to start with and not once that requires you drop the chain on the inner ring from the start. If anything it’s flatter than the profile above suggests. A few sharp sections can be scaled out of the saddle and there are descents to recover speed even if you’re still gaining altitude above the Lim valley. It’s not until 4km that the road pitches up, it’s here that things get hard. The hairpins after Cutigliano see the gradient reaching 7% and sometimes 8-9% and the slope is going to stay this way for most of the way up. These are Alpine gradients and it’s selective for a race. For the lone rider it’s easy as the wide road is well-engineered. The road might be famous for Coppi and Merckx but on an ordinary day it’s got potholes and traffic. The surface is fine, cracked in places in the summer of 2014 and perhaps it’ll be remade ahead of the Giro’s arrival in May? The road is wide for a reason, to allow traffic to speed up and down with ease. There are not too many reasons to drive over the pass but those that do are in a hurry and the wide road allows them to go fast, not ideal of the cyclist. With the traffic in mind the road is lined by large barriers, adding to the feel of a race track, especially given the volume of motorbikes, SS12 road is a long and scenic way from Abetone to Austria. Don’t be nervous, the road is lined with cyclists on a Sunday morning in summer keen to test themselves on something longer than Monte Serra. The worst traffic is the slow kind, the blue buses which toil up the slopes. Their sooty fumes are bad but worse is the hairdryer-hot zephyr that engulfs you. Sometimes RCS can exaggerate with their profiles, the steepest part of a climb in their profiles can require a theodolite to locate but this time there seemed to be several passages at 10% rather than one. Any changes of gradient can be spotted from a long way off and you’re only need to click up or down one gear at a time. The higher you go the more road enters an oak forest, the views of the valley below and the peaks above appear from time to time. The rewards will come later when you arrive at the top in Abetone, a small town that’s sprung up because of the road and the nearby ski slopes. It probably looks better with snow, in the summer the buildings look tired. The Verdict: a fast climb at the start, especially if tackled in a bunch. It’s long and the 5% average is flattered by a soft section to start with, after Cutigliano it’s 7-8% a lot of the way. It’s wide which means the traffic can pass with ease but it’s wide which means there’s a lot of traffic. Try in the summer on a Sunday morning and you’ll meet the locals. History: first used in 1928 it’s become more famous because of the 1940 stage from Florence to Modena when Fausto Coppi took off on the climb and went on to win in Modena, his first Giro stage win and he took over the race lead which he kept to the end. So the Coppi legend was born. There’s a small Coppi memorial on the way up, a square stone embedded in a wall. The 1959 Giro saw Abetone as summit finish on just the third stage. 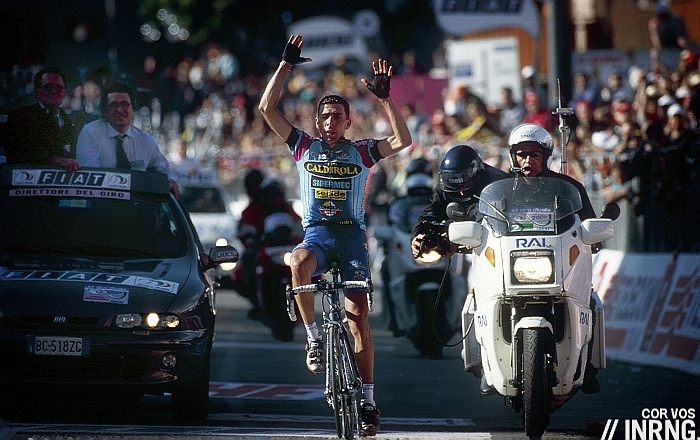 Charly Gaul won the stage and took the maglia rosa. Jacques Anquetil would lead the race later on but Gaul took back the lead and won. Merckx won in 1969, using the climb in the reverse direction and looked set to win the race but then came Savona. The town is synonymous with his positive doping test and a tearful Merckx was ejected from the race. Conspiracy theories flourished from lurking fans to angry team mates but Occam’s Razor’s suggests he was just unlucky to get caught. We can also look to 2000 when Francesco Casagrande won with a powerful solo attack to take the race lead not far from his home. Casagrande dominated the race until the final mountain stage when he cracked and was overhauled by Stefano Garzelli, a cruel defeat but if the Tuscan was a prolific winner he never managed to win big, collecting a series of week-long stage races and winning Flèche Wallonne rather than Liège. Aged 44 he’s still busy riding on these roads. Future: Such a big climb so early risks imposing a hierarchy early on in the race and the suspense for the following two and half weeks is diminished. It took a positive test to eject Merckx, a bad day for Casagrande and we can’t wish these events on anyone but if Alberto Contador is already the obvious pick for the 2015 Giro, here’s hoping he’s not in the lead after Abetone already. For the Giro we can expect plenty to be dropped and it’s the kind of climb where a strong team can do a lot of damage. It’s the kind of climb where the selection happens out of the back of the group rather than attacks of the front. But perhaps those with ambitions for the overall victory will avoid trying too hard. A calm climb would mean they’re not forced to lead the race early. You might think getting the pink jersey is a big deal and you’d be right however those with serious ambitions about winning the race overall maybe prefer to let someone else defend the jersey and perform daily media duties which can add to their fatigue. Travel and Access: the climb marks the border with Emilia-Romagna and Toscana, two Italian regions. Toscana, or Tuscany in English, is one of the heartlands of European cycling with many a famous pro and thousands upon thousands of weekend warriors. It is also one of Europe’s tourist hotspots but few visitors to Florence and Pisa venture too far. All the better for you as it means easy access but no crowds. Pisa airport is near, Florence is well served by rail plus the autostrada network. Pistoia can make a good base with excellent roads and some stunning renaissance architecture that’s free from the crowds. Several pros live in the area, one of the locals is Mark Cavendish. If you fancy a little detour onto a much quieter, steeper, road, so you can avoid the fast cars, smokey buses and trucks for a while (but stress the legs a bit more), then take a left at Ponte Sestaione / Cutigliano and go up via Pian di Novello on the SP20. At the junction at the end of the climb, go right to go back and rejoin the SS12 at Le Regine for the final push up to Abetone. The SP20 really rears up from Ponte Sestaione to Pian delgi Ontani. Couple of hundred metres of 10 to 12%. Good advice, it would make for a good loop. Nice write up but please, why describe Merckx as unlucky to get caught? Occams Razor would indicate that he was busted because he was cheating. No sympathy. He tested positive a couple of other times during his career. I was wondering whether he just got caught in Savona rather than a complex conspiracy? Fair enough; I missed that subtlety. Still no sympathy though. It looks like you may be missing quite a lot of other subtleties, too. Agreed. Oxygen-vector doping made the nonsense of the previous generations pretty much irrelevant. I’d venture Merckx, Coppi, Anquetil, Kelly etc etc – all of whom had “doping” issues would have been world class riders of their generation if it was uniformly “clean”. You just cannot say that of riders post-1990 as the changes to performance were so incredible. My lightbulb moment was after I shared a bottle of wine with a “monument” winner – who I won’t name – who turned up to races in the early 1990s wondering what the hell had happened, even in his own team, to such an extent that he gave up and had no involvement in pro-cycling for many years. It really was “donkeys to racehorses” stuff. And due to that, I really don’t think you should compare Merckx to Armstrong, despite some of the shameful things Merckx may have done post-retirement, that I’d hope he now regrets. Well said Gab and TD. Where can I find the list of which dopers are okay and which aren’t? I have a hard time keeping track. Nice. I was wondering how much energy a drafting rider saves in a pro bunch, on such a climb, as opposed to riding in the wind. Plenty at the speeds the Giro will go up. It’s hard to give one number as it’s a primarily a function of speed and gradient with other factors. But the riders in the Giro and other races do go so fast that sitting on a wheel in the mountains matters more than more ordinary riders might think or are used to. Thank you for the reply… In the same vein, the question will then be, if a top mountain gregario, say König for Porte, starts to TT, full steam ahead, from La Lima, how many riders will be left together by Piano Sinatico. I think 4 or 5. Or, as Inrng commented; selections might happen in the group rather than off the front. Either way, its going to be a elite group who make it to the finale . confess I’d not heard of this before but it seems famous for the exploits of greats. Who wins in the giro? First paragraph on ‘the feel’: well-signed posted, should read well signposted. Great piece. A compilation of these with more graphics and you’d have a rival for the great mountain high. I do love these climbing write-ups but speaking personally I find going uphill quite easy. It’s going downhill where my confidence drains away – is there any chance you could grade the difficulty of the descent as well? Thanks for that! I’ve done the Northern side many years ago in March and was quite underwhelmed. I rode to Abetone last September but from the northern side as part of a decent Sunday loop from Castelnuovo di Garfagnana. First up, I rode the ridiculous back route to San Pellegrino (a brutal climb they may well have included in the Giro were this stage to Abetone not so early in the race). After coffee atop the Passo Radici I made the long sweeping descent down to Pievepelago before tackling the climb to Abetone from Fiumalbo. 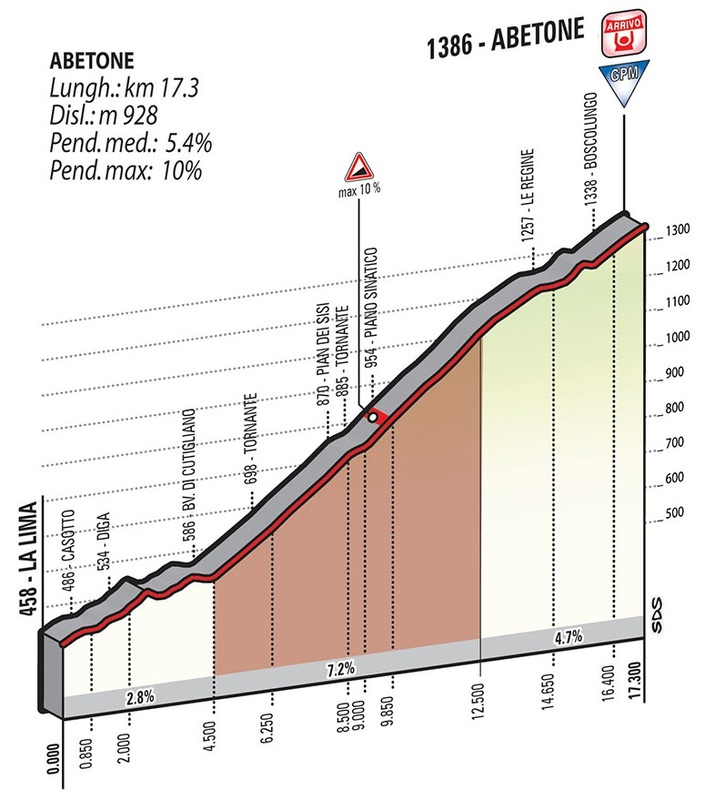 It’s probably steeper than the southern side – but believe me, after San Pellegrino, nothing seems very steep. Once I’d had a late lunch in the ski resort I rode down the southern side before completing the loop back to Castelnuovo via Bagni di Luca. I have to say, the descent Le Regine and La Lima (ie what the pros will be doing but in reverse) was one of the prettiest I’ve done. First up, you’re in an eerie forested area where, if you clip out of the pedals, you hear the noise echoing magically off all the trunks that stretch to the skies. Further down, the road runs alongside the river and the views are stunning – especially of the reservoir near the bottom. Carry on to Bagni di Luca and you pass a succession of hilltop towns and marble mines. The autumn leaves and a bright blue sky made the whole thing simply magnificent. The road was freshly tarmac’ed too, plus quiet. Not too many of those blue lorries! Anyway, thought I’d share. Click on my name and you’ll go to the Strava profile of the whole day. Cheers. +1 on the San Pellegrino. Gorgeous climb with some very steep sections towards the top. I rode in this area last September as well and was impressed with the quiet and how local it felt. Definitely not your tourist’s view of Tuscany. Once again the best cycling web site in the world delivers.